We still send people to the building pictured above with confidence as a reference. The paint job is 9 years old and has not been pressure washed yet. The only color that even shows fading is the deep base orange color at the bottom. It’s normal for deep base colors to fade more rapidly. Want to see it for yourself in person? Here’s the address: 5711 W Irlo Bronson Memorial Hwy, Kissimmee, FL 34746. We offer a very good and genuine 10 year warranty with minimal stipulations. You will have to use what is determined to be the best grade of paint for your project that is offered by the manufacturer. And follow their specified guidelines. It will require an annual inspection of the exterior and/or pressure washing of at least the mildewed areas. Which is a good and recommended practice anyway in Florida’s wet and humid climate. If any potential problem areas are discovered during the annual inspection they can and will be addressed at that time. And anything that falls within the warranty of course is at no additional cost to you. This is a great warranty, plus a great selling point if you desire to include it in a home warranty should you ever decide to sell your residence. This is also great preventative maintenance for your multistory office buildings and/or hotels. Since staging and lift work is very expensive on top of the cost of painting a multistory building, you’re way ahead of the game with a 10 year warranty. TIP: Be very leery of anyone that promises “lifetime” anything. “Lifetime” contractors usually charge 4 times what a premium quality paint job would cost for these so called “lifetime warranties”. In addition, product “lifetime warranties” only cover materials (not labor), are full of escape clauses and have a long list of requirements in order to recover a prorated payment. 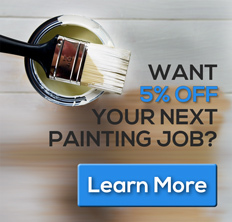 If you plan on changing colors that would require two coats of paint anyway, why not take advantage of our FREE decorator and Specification and Inspection Service. You can get a minimum of a 5 year written warranty and in most cases a 7 year warranty in writing when applying two coats. We can walk you through the process and do the leg work it takes to get our supplier to stand behind this really good warranty. Comparing competitive bids and making sure all bidders are on the same page so apples to apples comparisons can be made. Whether proper primers and prep procedures are being adhered too. What specific product line of paint is being applied. Whether the required number of coats are being applied and at the proper mil thickness. We also setup periodic site visits by our paint manufactuers sales representative at specific stages of the paint job. For example, after cleaning and prep, after prime coats prior to finish paint apply and usually again at the end of the job. Even though the industry standard is just 1 year, we know that most paint failures will occur in the first year or shortly thereafter. We want to give you the assurance that you are protected beyond 12 months. Whatever you do, don’t accept less than a full 2 year labor and material warranty from your paint company for any residential work. We include this for no additional charge, and we can even include this for some commercial jobs. FUN FACT: Many of our commercial and residential jobs have lasted as long as 10 years with proper preventative maintenance and upkeep. If you have any questions about our warranty options, please contact us here or call us directly at 407.877.3210.